The mainstream media loves the drama and the idiotic criminal element was there to oblige. Vastly overshadowing any of the 'legitimate' protests with their acts of wanton violence, these hooligans highjacked a lot of headlines today. However, they have not garnered any public support for their 'cause' as it is apparent they do not really have any cause except lawlessness. 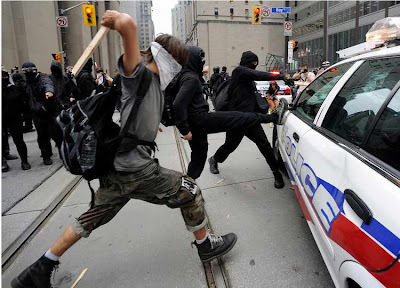 The media of course is quick to blame the police for not being able to stop some of the damage these thugs were able to cause. Perhaps the same media which has been questioning how much money security has cost, may question if we did not spend enough? Just a few observations, why did none of the law abiding citizens do anything to stop the acts of these criminals? Why is anyone running around hiding their identity not subject to immediate arrest as they clearly are up to no good. It is up to everyone in a free society, not just the police, to see that this element of criminality is not allowed to prosper. Yesterday, it was bricks and stones and a bit of fire. How long before these guys start bringing 'real' weapons to events. These guys are just as dangerous although not as well funded, as any terrorist organization which threatens a civilized society. As I suggested earlier, the press loves the drama, and are more in the info-tainment business than hard reporting these days, so I suspect the typical shallow reporting on these events to dominate the press over the next few days. That is until the next drama comes along. We may pride ourselves on this democratic, law abiding society we have in Canada, but it is evident that lurking just beneath the surface is the same lawless element that rears it's ugly head in other parts of the world all the time. Shame on these lawless hooligans, and shame on the law abiding citizens that do nothing to thwart the activities of these idiots. Shame on the press for making this look like some war torn mid-eastern country. A few burning police cars, and some broken windows completely dominate the 'news' today. People living a few blocks north of all the 'excitement' were cutting their grass, having a beer and a bar-b-cue just like any other Saturday. Of course, that makes for poor headlines.